Imagine eating something not entirely made by a human. Customers at Zume Pizza in Mountain View, California come in looking for delicious pizza. 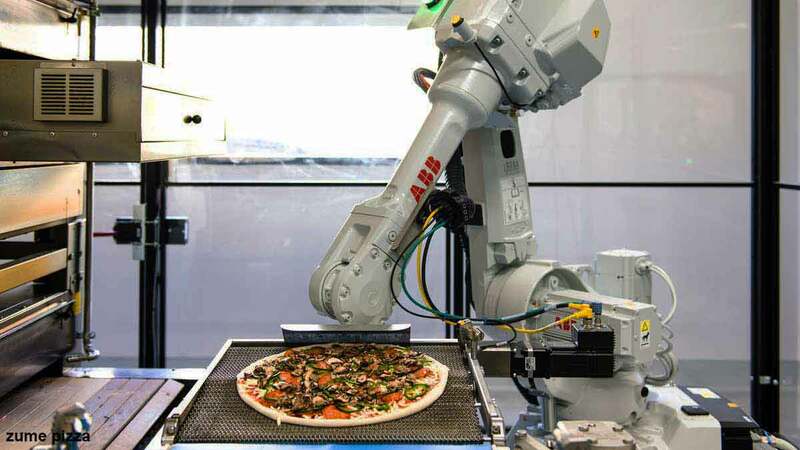 And they get just that, but with a twist: robots played a big role in making their pizza! Named as one of the Most Innovative Startups by the Fast Company, Zume is one of the startups attempting to automate the cooking process. At its restaurant, a combination of humans and robots work together to give customers the perfect pizza. “Automation can improve human life. I look at automation to create jobs that are better, safer, and higher paying,” said Zume CEO, Julia Collins. Different robots have different roles in the pizza making process: robot Pepe dispenses tomato sauce, Marta spreads it, and Bruno puts the pizzas in the oven. Their newest robot, Vincero, helps transfer pizzas to ovens. Zume develops all their robots with a common goal to “have robots work collaboratively with humans to make better jobs for humans. So the robots do jobs that are dangerous and repetitive,” Collins said. With less room for error and faster speeds, automation helps Zume to be a lot more efficient in their food production. They can make and deliver over 350 pizzas in an hour. Robots allow Zume to spend more money on getting the best ingredients without having their customers pay exorbitant fees. They work with small farmers to source local seasonal ingredients as much as possible. Having robots take care of the cooking allows Zume’s staff members to focus on interacting with their customers and customer service, an important aspect of a Zume customer’s experience. Zume’s staff get higher pay and a full range of benefits. In line with their mission, Zume offers their staff a chance to learn about technology through tutoring in programming and data science and also tuition reimbursement. Zume Pizza isn’t the only company working to automate restaurants. Many other companies in Silicon Valley are trying to automate the cooking process for various foods. Robot Sally can make you thousands of different salads. Easta’s robots make custom vegetarian bowls. In June, Momentum Machines, a robotics company, opened Creator, a restaurant using robots to make burgers, in San Francisco. The companies are not after your jobs. In fact, they all share one thing in common: “We are trying to create better retail jobs and reinvent jobs,” Creator’s Chief Operating Officer Steven Frehn said.